Oscar Winner: Best Supporting Actress. Golden Globe Winner: Best Supporting Actress. 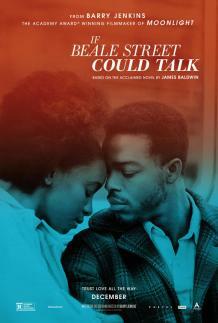 “Love infuses director Barry Jenkins’ ravishing adaptation of the 1974 James Baldwin novel about a battered romance that refuses to be a tragedy. Following up Moonlight, the writer-director opens his third film with Tish Rivers (KiKi Layne), 19, and Alonzo Hunt, a.k.a. Fonny (Stephan James), 22, strolling along the Hudson river. The fact that they’re wearing bright colors tells you everything you need to know. He’s not trying to give you gritty realism. Jenkins wants to create a tone poem out of heartbreak.